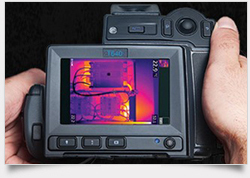 Advanced Electrical Systems utilizes a state of the art Flir T440 Thermal Infrared Camera to perform thermography inspections of all types of electrical equipment. The National Fire Protection Association (NFPA) 70B §11.17.5 suggests that every commercial and industrial building in the United States should have an IR survey at least once a year. 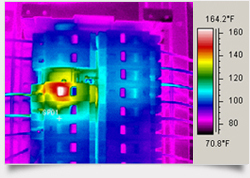 If you are a facility manager or building owner who is responsible for safety and repairs at your facility, you cannot afford to be without a regular (IR) thermographic survey of your electrical equipment. In electrical systems, increased resistance can be caused by component age, fatigue, oxidation, wear, loose connections, or poor installation. Excess resistance on electrical apparatus indicates electrical faults such as loose connections, overloaded or imbalanced circuits, faulty breakers, damaged switches, faulty fuses, and a wide range of other unwanted electrical conditions. Before an electrical component burns up, it heats up. 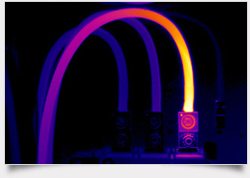 Thermography is used to see the excess heat (resistance) so that problems can be found and corrected before the component fails, which causes damage to the component, safety hazards and/or downtime. A detailed report including thermal images will be provided illustrating any issues found. 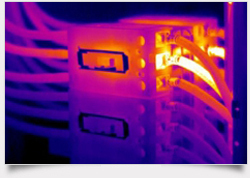 In addition to IR Thermography, AES will also conduct thorough visual inspections, inspect for code violations, missing labeling, and when possible, tighten all terminations, and clean the electrical equipment. 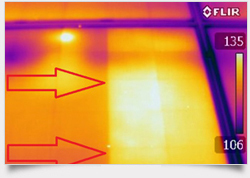 Thermal Imaging is also extremely helpful in maintaining & troubleshooting solar photovoltic arrays. Faulty cells, and sections of solar panels can be located. 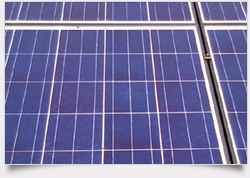 Finding these issues may allow PV system owners to have these modules replaced under warranty, thereby restoring system performance and return on investment. 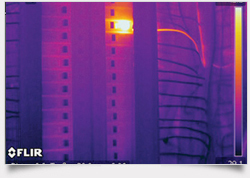 The advantage to working with Advanced Electrical Systems is that we use a Certified Thermographer to conduct the survey, and Licensed Electricians to perform any repairs necessary. There is no need to deal with multiple companies to identify and rectify problems. 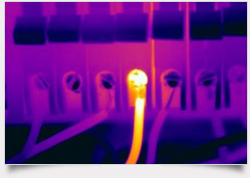 Please call us today at 283-6255 to discuss electrical maintenance and inspection for your facility. Did you know: corrosion is a major factor here in the islands, being in close proximity to the ocean. The salt air causes accelerated oxidation of electrical components. 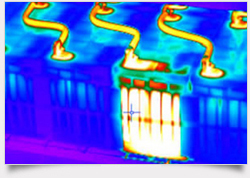 AES has replaced countless electrical panels that were damaged by arcing & overheating, caused by corrosion.